Daniel outside his new apartment door. Daniel wearing his shirt he got from us as part of his Birthday present. Yesterday, Ben and I took Daniel out for his birthday (belated). We picked up Daniel from the metro in Fairfax and took him to lunch at On the Border. We had a huge lunch, got chips and salsa to go, and headed over to the Apple store in Reston Town Center. There Daniel played with the ipad while Ben and I contemplated the purchase of the 27 inch imac. (We didn't purchase it....yet) Then we headed over to Trader Joe's where we bought some delicious cookies (peanut butter with milk chocolate chunks) and of course, mochi. Then we headed into DC to take Daniel back. We got to see his new apartment and I did take some pictures that I will hopefully upload soon. How cool is this?!?! 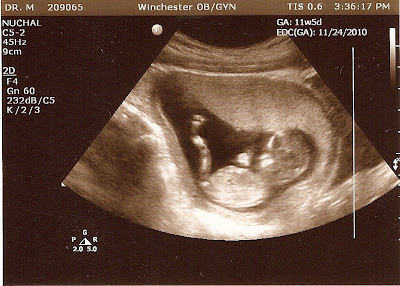 The Doctor said that i get the award for best ultrasound. The baby was moving all over the place! And this ultrasound was our most favorite. (It was the doctor's favorite too!) We are so excited! The baby looks healthy and happy says the doctor. And I get to go to my old OB/GYN for a couple more appointments before the high risk doctor wants to see me exclusively. Starting in July I will be going in every two weeks so they can monitor me very closely as my biggest risk is premature delivery. But as of now, the due date is still November 24th!